Yesterday Dartmoor National Park was host to the third QGIS user group for the South West region. We a great range of talks from the worlds of academia, offshore exploration and local government to name but a few. The slides from these are below. We are looking at having another meet up in the spring and are thinking of running some workshops on form designing and plugin building. Keep an eye on the main QGIS user group page on Google+ for any news. Thanks again to everyone who attending and presented. We also need to give a special thanks to Clear Mapping Company for sponsoring the event. Last week I attended an Ordnance Survey OpenData MasterClass in Exeter. This was one of a series of seven masterclasses that the Ordnance Survey were running across the country. They were aimed at letting people know how to get the best of the OpenData products that they provide. The workshop was delivered in a format of combining theory and practical sessions. They were aimed at people of various experience; from those new to working with location data to the more advanced users wanting to brush up on their skills. 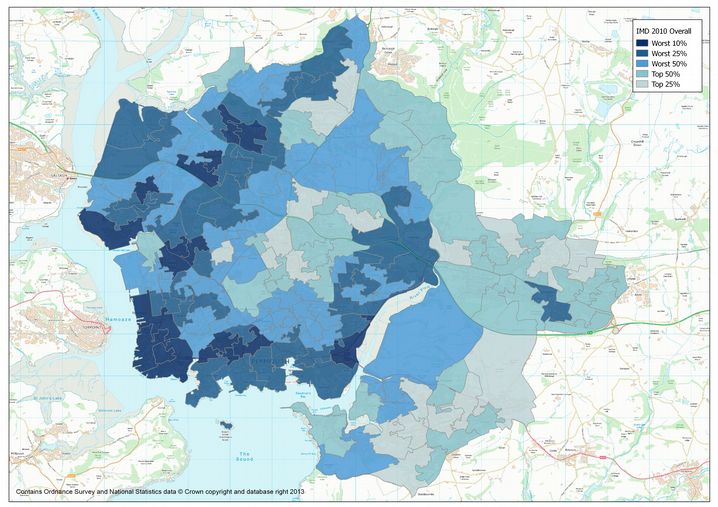 Create thematic maps from LSOA boundaries and ONS data (like the one below) – here I learnt you can now load non-geographic data from a csv straight into QGIS without using a csvt file, yay! After Lunch and a quick insight by Chris Parker into the next Geovation Challenge , Chris Wesson from the Carto Design team at the OS gave a cartographic design workshop. This started off with a talk about the basic design principles behind cartography and how you should bear these in mind when making a map. He then showed us how to import vector map district vector data and then style these in a various ways – I particularly found his tips on creating road casing useful. Some of the maps being were produced were of a really good standard, especially when you this was many people’s first time using a GIS of any sort. I thought that this was a really worthwhile experience and would recommend going to one if you get the chance in the future (according to their website there are still masterclasses to come in York and Nottingham). I learnt a fair bit myself as I always think it’s useful to watch someone else use a product that you’ve used in isolation. They might do something that you’ve never seen before that’s loads quicker or show you a hidden feature you’ve not come across. In the New Year I’m going to look into having a QGIS South West event and hope to reach out to all types of QGIS users across the region. I’ll keep you posted on the exact details via the Google+ group but if you read this and are in or around the South West and want to share your experiences of using QGIS (no matter how big or small) then please get in touch. That’s it for now. Just leaves me to thank all the people that made the OS Masterclasses possible I’m sure they’ve been a success so hopefully they’ll be even more next year to look forward to!